We are now taking bookings for 2019 and 2020 however some 2019 weeks have already been confirmed by repeat guests. PLEASE NOTE: If you're expecting a reply from us please check your spam/junk folder just in case our message has ended up there by mistake. We always try to reply within a couple of hours. Please call if you don't hear back from us though as sometimes we don't receive messages via the G/Tree messaging system. 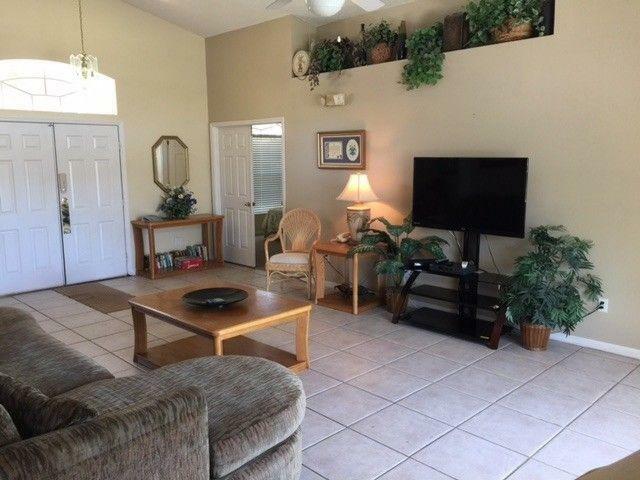 Our 4-bedroom rental home is near Disney in Florida and is in a perfect location for getting to all the theme parks and shopping malls etc. We have been travelling to Florida ourselves since 1978 and we've owned the house for 17 years now - it gets booked solid year after year. We are constantly making improvements to make it as nice as possible for each family that stay. A map showing the location can be emailed together with additional photographs and our full UK contact details (phone number and address). Over the years we have compiled a shortlist of websites for discounted flights and attraction tickets. We will happily send it to anyone thinking of visiting the sunshine state. WE HAVE A F/BOOK PAGE FOR THE HOUSE WHERE YOU WILL FIND INFORMATION ON LOCAL PLACES TO VISIT ETC, PLUS SOME RECENT 5* REVIEWS. JUST POP 'DAVENPORT FLORIDA VILLA' INTO THE SEARCH BOX AND THAT SHOULD FIND IT. PLEASE 'LIKE' OUR PAGE AS THIS IS THE FIRST PLACE WHERE SPECIAL OFFERS WILL BE ADDED. In 2018 our nightly rate starts at £65.00 (excluding offer periods) including the 12% US taxes and end of rental clean. These rates are for the house and not per person of course. Pool heat is £15.00 per night and will stay at that until further notice. IMPORTANT: The whole booking/payment process is done direct with us and not via a 3rd party agent. You won't need to drive to an office somewhere in Orlando to pick up the keys when you arrive. We will provide everything 3-4 weeks before you travel so that you can drive directly to our villa from the airport. WE ENCOURAGE PEOPLE TO CALL US BEFORE BOOKING SO THEY CAN BE COMPLETELY SATISFIED THAT WE ARE GENUINE OWNERS. HOWEVER DUE TO THE RIDICULOUS AMOUNT OF COLD CALLS WE GET WE WILL GENERALLY ONLY PICK UP WHEN SOMEONE STARTS LEAVING A MESSAGE. IF YOU HATE ANSWERING MACHINES JUST POP A TEXT OVER TO US (07896 232450) WITH YOUR DATES INSTEAD AND WE'LL RESPOND TO THAT. A large Publix supermarket is just 1.5 miles down the road and a HUGE Walmart a little bit further. There are many other shops and restaurants close by and the Posner Park Retail Center is 5 minutes south by car. The 192 is just 5 minutes north by car. The Disney exit off I-4 takes 15-20 minutes by car. One of the bathrooms is a large en-suite to the master bedroom. There is a games room which is great to keep children occupied and we provide an upgraded cable TV package and high speed wireless internet access. The villa pool does not back on to other houses, plus for additional privacy there is a screen down both sides of the pool enclosure. There are plenty of pool chairs and loungers plus a safety fence to keep children safe. The nearest large supermarket is located at the Berry Center - approx. 1.5 miles north on the 27. It's an absolute doddle to get to although a car will be required. The current retailers are listed below however more will be added soon - the latest opening is an IHOP Restaurant.